Well it’s official 2014 is here! Last night, we just hung-out at home and watched the Jets game. It was quiet and relaxing ~ a nice way to bring in the new year. The kids stayed up until 1 and I headed off to bed at 2 am, well passed my usual 9 to 10 pm bedtime. Tim wandered into bed sometime after that. We all woke up to the tune of “Happy Birthday” blaring from Shay’s Winnipeg Jets alarm clock at 7 this a.m. Shay didn’t know how to turn it off, so the noise echoed through the house for endless minutes until someone finally responded. We are all tired and a bit grumpy this morning. Lack of sleep will do that. Not the best way to welcome 2014, but regardless of the fatigue and irritability, the new year is here. I am not huge on New Year’s resolutions, but I do see the new year as another opportunity to reflect on the previous year and consider how to make 2014 even better. I hate the idea of “plateauing” in any area of life and strive to constantly work on becoming a better person. I truly believe that we are to continually work on “raising the bar” and elevating the way we do life. Of course, this can become overwhelming at times, especially when you understand that you will never “arrive” ~ life is a journey with no real destination. For every goal that you reach, a new goal should be set to replace it, so that you are in perpetual motion, always moving forward. The bible teaches us about the “Fruits of the Spirit“. You don’t have to be a Christian to agree that each one of us is born with the seeds to produce the “Fruits of the Spirit”. However, it is our job to nurture those seeds, so that we can produce this “fruit” in our lives. When you consider popular New Year’s resolutions such as spending quality time with family, exercising, dieting, quitting a bad habit such as smoking, and getting out of debt, you will notice that most can be traced directly back to one of the fruits. If spending time with family is your goal, the fruits all support the building of strong relationships. If you are suffering from anxiety or depression or maybe just worry too much ~ seek peace. So many New Year’s resolutions aren’t about starting something, but more about stopping or controlling something in our lives. Are you trying to eat better, quite smoking, stop drinking or limit your spending ~ if the answer to any of these is yes, you are really talking about self-control. What I have found is that if I trace my goal back to the core of the problem, it can usually be found in one of the fruits. Once you know the core of the problem, you can begin to focus on building this area of your life. This can be done through great teaching in the form of pod casts, books and even YouTube videos. For me, church super charges me for the week and then I listen to downloads on my iPod on the way to work. This makes the drive go quickly and doesn’t take additional time out of my day. Just being aware seems to help. So for example, if losing weight is one of your New Year’s resolutions, recognize that self-control is a big part of this. Work on incorporating new daily habits that will help you to build your ability to demonstrate self-control. It is so much more about the little changes that you make on a daily basis that in turn become your new normal. I loved what Jeremy Statton had to say about resolutions. It is the small things occurring on a regular basis, adding up over time, that define who we are. We also need to recognize that the circumstances that life throws at us can help us to develop each of these areas in our life. In looking back on my life, the most difficult situations have often been the catalyst that has helped to propel me forward and reach a new level in life. For every storm we weather, we become stronger and more capable of conquering the next obstacle. Take a moment to reflect and I am sure that you will see that what seemed insurmountable a few years ago, now seems like it is not such a big idea. I remember the days when I used to throw-up before public speaking and would break into a sweat if I had to make an announcement at a staff meeting ~ now they want to muzzle me. Go figure! Another example was when my mom died when I was 30. It was very difficult to not only lose my mom, but the prospect of my kids losing an incredible grandma and role model. I knew she would never be a grandma to my children and that my children would never have the opportunity to have that quality grandma time with her. She would never be there to bake cookies with them, do crafts together or have them for sleepovers. My kids have missed out on the experience of having her in their life and for that I am still sad. However, living through the experience of her illness and passing actually elevated my own faithfulness and helped shaped me into the person I am today. I can look back on so many of the trials in my life and see how in the end it was the means to creating a better “me”. I encourage you to fill your heart and mind with “food” for your spirit. There are many great speakers and writers, both Christian and secular that can tap into your areas of need. I think for any change to be permanent, you really do have to work from the inside out. Those external steps and habits are really important, but without changing what you believe about yourself and the kind of person you are, long-term transformation is difficult. 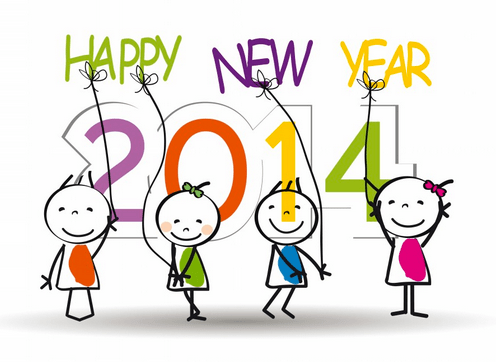 Best wishes for an incredible 2014!